Don’t put broken glass, needles or, for goodness sake, knives in your plastic rubbish bag. That is the message that Brussels trash collection service Pro Brussels is trying to get through to people with a new campaign launched this week. Bright red posters in metro stations and other public places feature one simple phrase: Il suffit d’une fois, or Once is enough. The online campaign details injuries sustained by rubbish collectors because of sharp objects cutting through the plastic bag. In 2017, nearly 100 incidents in Brussels required medical attention. Some of them were quite serious, requiring stiches, leaving behind scars and keeping the employee off work for days or weeks. Injuries have been caused by broken dishes, as well as toxic chemicals, knives, shards of glass and needles. The campaign goes over how to dispose of all such potentially dangerous objects or substances. Pro Brussels asks that all sharp objects be wrapped sufficiently in newspaper and then put in the middle of the bag, surrounded on all sides by other trash. Needles should be put in a special container sold at pharmacies and taken – along with any toxic substances, such as insecticides and paint thinners – to the recycle park. The collectors are of course insured for all medical costs, but, said a spokesperson, “insurance can’t repair a sliced tendon or return a severed finger”. Pro Brussels really deserves their name: surrealism has to be fought with surrealism! 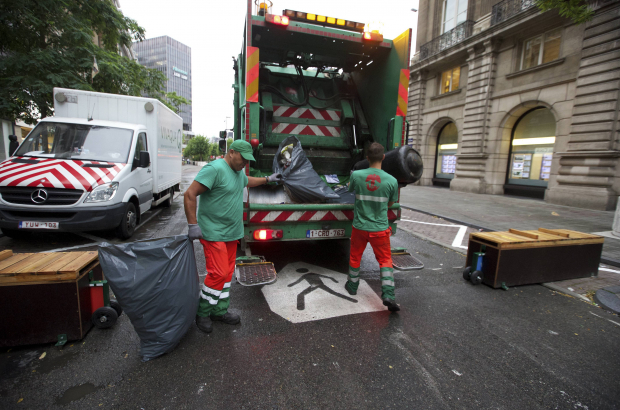 The cause of the dangerous injuries are the surrealistic Brussels garbage collection that is today only seen in some underdeveloped countries that still throw waste backs on the street. The simple solution would be to arrive in 21 century and allocate waste containers to households. But Brussels can do better! Wrap sharp staff in paper and put it in the middle of a sack!!! Besides the fact that paper belongs in a different sack (Pro Brussels obviously never head of this) it remains a mystery how something remains in a middle of a sack that is pushed in all directions!